PINNED - BLIND EMBOSSING EXAMPLES:- shown on Pristine white Colorplan 540gsm. Embossed letterpress business cards for Italian Architect Terenzio. Black text font is TRAJAN. • LEFT: Blind 'EMBOSSED' – the image is pushed up from the back and requires 2 dies, male and female. There is an extra cost for a set of embossing dies – it isn’t possible to emboss fine detail on the thick (540gsm) card – a thinner card would need to be used for embossing fine artwork content, i.e. 350gsm. A minimum line thickness of 2pts is required to achieve a good result with embossing on 540gsm card. • MIDDLE: Blind 'DEBOSSED' – the image is pressed in from the front and should be barely visible on the reverse as the thick card (540/700gsm) will absorb the impression. Blind debossing is an extra pass and is charged as normal 1 colour. • RIGHT: Blind ‘DE-EMBOSSED’ – 'de-embossed' is a term I use when a solid area around the image is pressed into the card giving the perception of the image being embossed and should be barely visible on the reverse as the thick card (540/700gsm) will absorb the impression. Blind ‘de-embossing’ is an extra pass and is charged as normal 1 colour. - Printers Terms: BLIND – using no colour. IMPRESSION – the pressure/indentation created by the letterpress process. PASS – a single run through the machine. Another beautiful embossed gold foil business card on Colorplan pattern blind embossed in Claret 540gsm with Trajan typeface. Amanda contacted me from Brussels for some business cards to a style she'd seen online that I'd made for myself using the same Trajan typeface. Most customers supply their own black on white PDFs but I'm happy to do the typesetting to a customer's chosen design / type style - as in this case. For Trajan font I regard 7pt as being just about the minimum suitable size for the plate making and letterpress foil printing process. White and green hot foil business cards on real grey Colorplan for print designer Alan Pearce. STUNNING MINIMALIST BUSINESS CARD for Longimanus designed by Design Plume - Pristine White Colorplan 540gsm with black foil and blind deboss. This was a very interesting order for me as I'm a lifelong angler and interested in all fish species - and also because it introduced me to Bora Bora which I'd never heard of until contacted to produce these business cards.
" Longimanus is a French Polynesian consulting company named after the whitetip shark, and for its logo we decided to show only the shark's distinguishing characteristic, its white-tipped dorsal fin. Longimanus business cards were debossed (and blind-debossed) on extra thick (540gsm) Pristine White Colorplan by David Ward of David Ward Printing, whom we highly recommend for his professionalism and for the quality of his work. " Bright satin red foil and white foil - design/artwork supplied by client. The extra thick black card allowed for a nice deep deboss of the RED FOIL giving the impression of the white lion's head being embossed (raised up) without the reverse of the card being damaged - text details on the reverse were printed with white foil. Often called embossed business cards, these cards are 'printed' without ink or foil - only using the weight/pressure and heat of the foiling machine to create a deep crisp image of the printing plate or die. Using quite a high temperature to deboss gives an advantage over the normal letterpress process which does not have heat available. It's best to avoid very small type for this process - when done properly there should be very little show-through on the reverse side of the card. 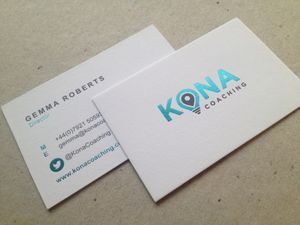 540GSM Pristine white business cards for Kona Coaching, letterpress hot foil business card with metallic aqua foil and dark grey mat foil. This stunning business card was designed by professional graphic designer Paula McGarry at Macsima Design, London SE16 - macsima.co.uk - Paula is a very capable designer with a great understanding of the letterpress/foil printing process and I can totally recommend Paula if you need help with a design project. TYPE - size is not too small (min 8pt) and not too fine (ultra fine fonts in small sizes are difficult to 'hold' during the plate etching process and can buckle under pressure when printing) - all text has additional letter spacing - this is always a good idea for letterpress, but especially for 'tight' fonts. Also content is minimal - avoid unnecessary text as this can make the card appear cluttered (avoid addresses etc if possible). DUPLEX COLORPLAN DARK GREY and PRISTINE WHITE BUSINESS CARDS (700gsm) with Copper foil and blind deboss on the front and letterpress black ink for text details on the white side. G F SMITH EMBOSSED BUSINESS CARDS London - G F Smith Claret 540gsm embossed printed with medium gold hot foil on both sides. These are very elegant classy business cards (design supplied by client) with perfect typography - the text details on the reverse are the same font (Trajan) in 7pt. 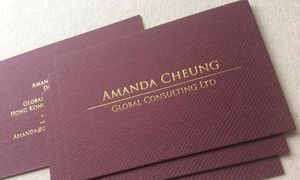 The card is 540gsm G F Smith Colorplan Gravure Embossed (emboss is one side only) in Claret. 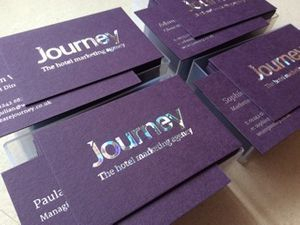 These business cards for Journey Hotel Marketing Agency http://www.wearejourney.co.uk/ were part of a multiple order for several staff members, with a new design/branding supplied by their designers - text font choice and size are perfect and the end result it a very special business card. They specified a special order foil called "holographic silver cracked ice" for the front (logo) side and plain silver for the text details on the reverse. I used a satin silver foil for the text as this is more legible for small type than the other silver options. Classy Ebony Black business cards for London author - on Colorplan 540gsm EBONY card with MATT SILVER FOIL details and BLIND EMBOSSED LOGO. This card is unusual because I don't usually offer true EMBOSSING (image pushed up from the back), the reason being that customer supplied artwork/logos aren't usually suitable for embossing on the thick card - so we usually suggest debossed or 'de-embossed' as a better option. Another point to bear in mind is that a set of embossing dies carries an extra charge and also the actual production process also costs extra - so a flexible budget is needed for this. But this logo was a chunky font of 3 letters with no fine content and the customer was happy to pay the extra cost - it turned out a very classy and impressive minimalist card and both client and myself were very pleased with the end result. COLORPLAN DUPLEX LETTERPRESS BUSINESS CARD (700gsm) Pristine White/Mandarin with Orange foil and black letterpress ink text and white foil on the orange side. Quite a striking business card to complement company colours. I sometimes use letterpress ink instead of foil where I feel this is the best option - it would be almost impossible for most people to spot the difference between matt black foil and black ink for text. This is the second time I've produced a batch of cards for this client - designed by professional designer Catalin http://creativepool.com/catamm artwork was tweaked this time around and rose gold was specified as opposed to bright (normal) gold when I produced them a couple of years ago. I can highly recommend Catalin if you have a design project you'd like help with. The text font is Calendas Plus - this is one of my personal favourite serifed fonts for hot foil printing as the strokes are not too fine in smaller sizes for the plate making process. Company logo hot foil stamped with white foil on Blue side - Black text and blind debossed logo on the white side. 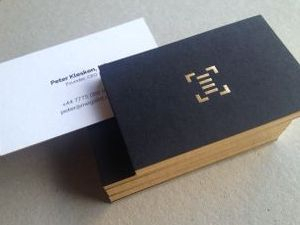 1 AUGUST 2014 - GOLD FOIL BUSINESS CARDS with black text and gilded (gold foiled) edges. 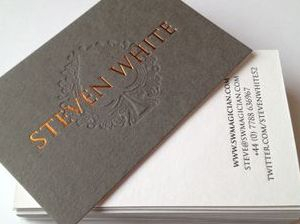 Gold hot foil printed business cards on Colorplan pristine white 540gsm. The gold script font is SCRIPTINA (modified) and the black letterpress foil text is TRAJAN font. based on 1 clamp full of cards at the gilders - edge painting is a cheaper option. COLORPLAN DUPLEX BUSINESS CARD 700gsm - Pristine White and Sapphire blue card with matching blue letterpress foil plus black text on the white side and a nice deep blind deboss on the blue side - when done properly a blind deboss will barely show through on the reverse of the card. Bespoke extra thick business card for Natasha Hawtrey-Woore, London E17. Gold foil printed and blind debossed on Colorplan 700gsm Turqoise. The 700gsm card allows a nice deep impression for the deboss without showing on the reverse of the card - although 540gsm is generally regarded as 'thick enough' the 700gsm is a bit more special - and as this card colour is a special order colour there's no reason not to go fot the 700gsm option. • Artwork supplied by client. NOTES. With gold foil on medium shades of card colour care needs to be taken to ensure legibility of small text details such as phone numbers - suggested minimum type size approx 8/9pt depending on font. Sans serifed fonts and caps may be suitable slightly smaller. In fact sans serif would be a better option for small type as their are no fine strokes. Luxury Gilt edged business cards for Peter K., London - these cards have be gold foil edged, more expensive but much better than gold painted edges. Card is Colorplan DUPLEXED ebony/pristine white 700gsm printed with gold foil on ebony and black text on pristine white. Black text on white was a wise choice as small gold lettering in fine type does not show up well on white card - although ok on darker shades of card. The 700gsm duplexed card is top of the range for a bespoke business card. 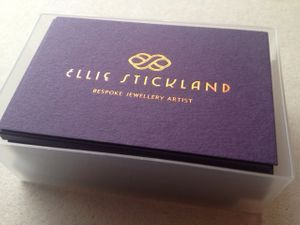 CARD: COLORPLAN AMETHYST 540gsm for bespoke jewellery designer Ellie Stickland. They've arrived! The quality of the cards is amazing! London Shisha supplied artwork for these stunning business cards gold foiled onto Colorplan Ebony 540gsm. A professionally designed logo really helps any business card stand out from the rest. Simple grey letterpress text on Pristine White 540gsm natural grained uncoated card makes these business cards very special - the metallic aquamarine edge foiling is simply stunning. Edge painted business cards are a less costly option to EDGE FOILED business cards. As can be seen from the photos edge paint gives a more subtle (or less striking) result with a matt finish. GILT EDGED BUSINESS CARDS also called gilded business cards, edge painted business cards, gold foil edges, edge printed business card. The best results in my opinion is achieved from hot foil edged business cards rather than any kind of paint, printing or ink. When a stack of cards are gold foil edged properly they look totally stunning - just like a bar of gold. This technique requires a very high level os craftsmanship as well as all the right equipment and years of experience and there are very few companies able to offer this to a professional level. 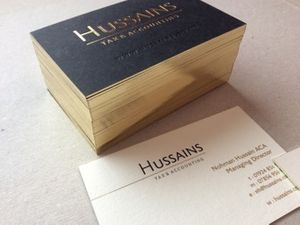 There are a few who are 'playing' at it but the results can be very poor and really a waste os money - as bad edge colouring on business cards can look worse than just plain edges. When other colours are required to match Pantone refs there is the option of edge painting using special inks mixed to the correct shade. 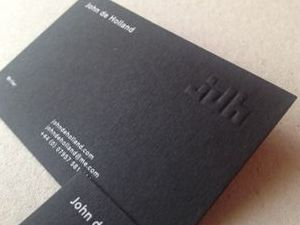 (1) Business cards for London author - Colorplan 540gsm EBONY card with WHITE FOIL details and BLIND EMBOSSED LOGO. This card is unusual because I don't usually offer true EMBOSSING (image pushed up from the back), the reason being that customer supplied artwork/logos aren't usually suitable for embossing on the thick card - so we usually suggest debossed or 'de-embossed' as a better option. Another point to bear in mind is that a set of embossing dies carries an extra charge and also the actual production process also costs extra - so a flexible budget is needed for this. But this logo was a chunky font of 3 letters with no fine content and the customer was happy to pay the extra cost - it turned out a very classy and impressive minimalist card and both client and myself were very pleased with the end result. 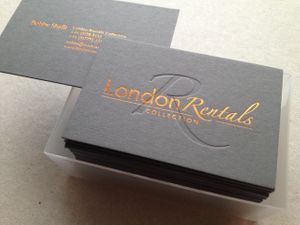 (1) Business cards for a London designer. ROSE GOLD FOIL BUSINESS CARDS on Colorplan DARK GREY 540gsm. This is the first time I've been asked for rose gold foil - I sourced this from Foilco and it really is pretty special with a classy satin finish rather than bright metallic. It also looks very good on the other colours I tested - Ebony and Pristine white. (2) Business cards for high end kitchen company, Leeds. Cards were printed LItho CMYK on 580gsm matt laminated board with GOLD FOIL LOGO overprinted. This is a less expensive option than multicolour letterpress and/or foil on Colorplan card - with each colour on each side needing an extra pass through the machine. I see this as being the next best thing to fully foil printed cards - and also some people do prefer the smooth velvety feel of matt lamination. The cards were a total of 5 colours and would have been more or less double the price if fully produced by letterpress/foil process. (3) Chateau Bee, Guernsey - Colorplan DUPLEX CLARET and PRISTINE WHITE 540gsm. Printed letterpress claret ink on white side and white foil on claret side - www.thechateuabee.com - these cards are unusual in that they are a combination of letterpress ink and foil. A colour match for the Colorplan claret was specified by the customer and as I was unable to source a suitable colour match in foil I had to revert to mixing a pantone shade and printing the back letterpress. The front of the card was to be white image on Claret card so had to be white foil as white ink isn't opaque enough to print properly on dark colours of stock.